I noticed greater development of qualities of the heart. It’s easier for me to accomplish tasks. I feel more flow and joy in daily life, increased inner softness, no disturbing dreams. Everything is more effortless and takes less energy as compared to non-Vastu (which is like walking through water, difficult, and somewhat of a drag in comparison). There is no aspect of my home which bothers or irritates me. It feels intimately mine, like my clothes—a part of me. When we first moved into the house, I found that I could just be myself. There was no cramping or negative influence on me from the building. 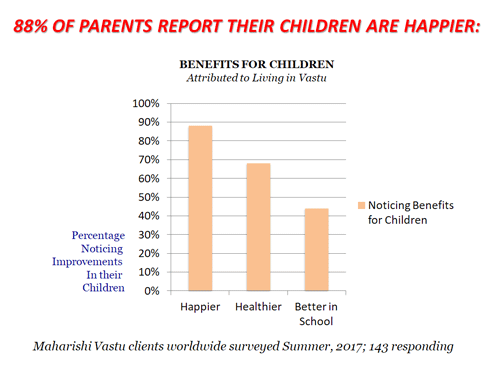 Within a year of moving into the house, good things were happening for my family members [mother and brother] who do not live in Vastu or practice TM. I have grown in ways that I could not have expected or predicted. Life for most people has ups and downs. I've found that I'm more even in handling situations that arise (whether positive or otherwise) and do not get overshadowed. I can focus on what needs to get done and get it done with more evenness. This seems to have grown the longer I've been in Vastu. The more I live in our Vastu home, the less I want to leave. The house feels like a protective bubble from the stress of the outside world. It is a haven of peace and harmony that visitors can feel immediately. Even those who are not inclined to notice such things remark on the wonderful, peaceful feeling they have when entering our home—as if a burden has been lifted and they can relax. Many people ask us if we notice a difference living in Vastu. 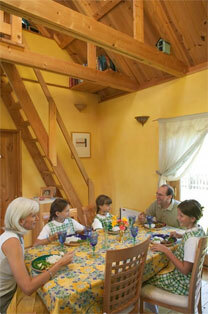 We always answer an emphatic “Yes!” Our experience is that the walls of the home protect but do not restrict. Being happy was the very first thing I noticed about living in our house. It is hard to describe being really happy for the first time since being a child, but that is the main experience from living in a Maharishi Vastu home that I appreciate the most. My husband was able to secure the best job of his career since moving in here, and he directly credits the house for this help. My health has improved greatly, and my life as a whole is in a much more evolutionary direction now. The house seems to get me up on time in the morning and helps me get to bed on time at night. I also feel very protected and safe in this house. If some storm is raging outside, I somehow feel that all is well as long as I am in our house. I cannot say enough good things about living in a Maharishi Vastu home. I tell everyone who asks me that it’s worth every penny. It is worth the extra effort to get into a Fortune-Creating home, and they should do everything in their power to do so. Upon moving into my first Fortune-Creating home, I noticed I slept more soundly without waking up during the night. My thinking was clearer, and I made better choices in business and in my personal life. When I had to temporarily move out, I really noticed the contrast: my sleep became worse again, and I stayed up too late at night for no reason. The nurturing support was gone. 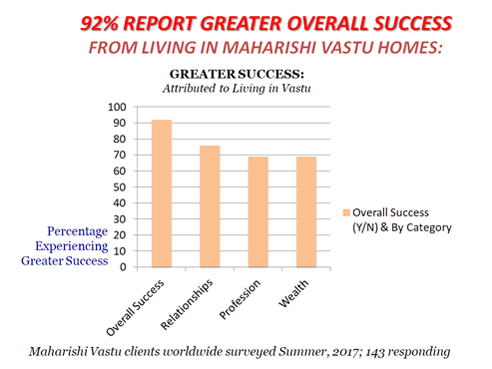 A year later I was able to move back into a Maharishi Vastu home, and what a relief that was! Again, my sleep immediately improved, as did my daily routine. My wealth grew with less effort, and my health also improved. The choices I made were better, and the quality of my life is much better. I will never move out of Vastu homes again. I am living in the Sthapatya Veda building, and what I feel is that the walls of the house don’t produce a cage for me. I don’t feel that I am living inside the walls. The walls are as transparent as is the meaning of Cosmic Living; you don’t feel that you are cramped by the walls. I have been…for fifty, forty years—living wherever I went…with whomsoever kept me as his guest...and always I was feeling, “I am caged within these walls.” And ever since they gave me this house to live in, I'm not feeling restricted. This is Cosmic Living. I am living within the walls, but the walls are transparent for me….I am very afraid to go to any other house. I never feel to go, because I will be caged in. Such freedom, such abundance, such enormous mastery over space and time is the reality of living in Cosmic magnitude. This is living in Vastu building. The events described above are as reported to us by the persons who experienced them. They do not constitute representations or warranties of any kind, express or implied, that the Maharishi Vastu architecture system will provide specific benefits or protection from natural occurrences. Any reliance you place on such information is therefore strictly at your own risk. 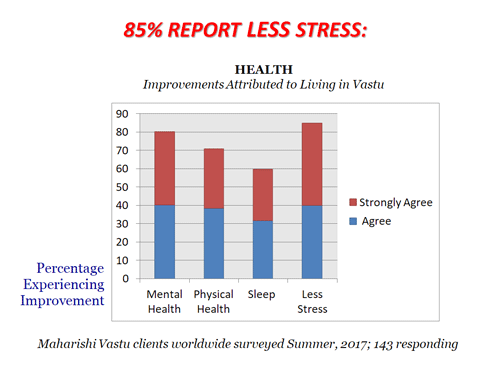 Do the people who live in Maharishi Vastu find that it works? 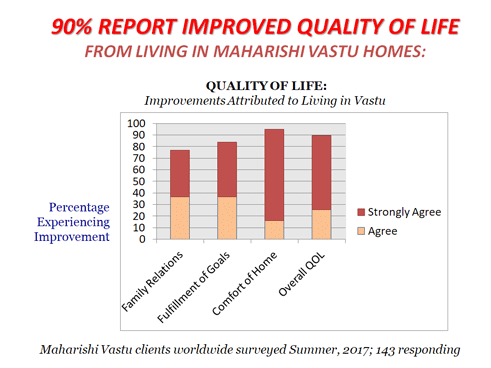 A widely-published research sociologist wanted to find out, so he sent a comprehensive survey measuring quality of life to several hundred people worldwide who live in Maharishi Vastu dwellings. 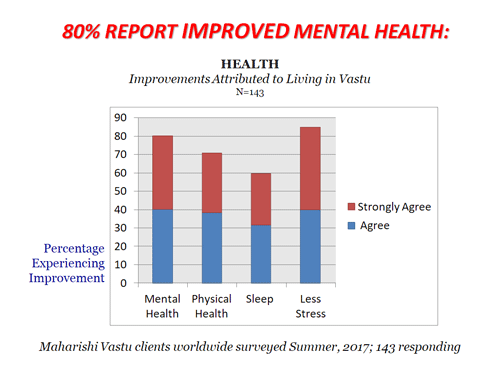 The survey’s results are powerful; they lend a great deal of credence to Maharishi’s prediction that living in these homes would create an influence of good health, happiness, family harmony, and growth to enlightenment. They demonstrate the unique effectiveness of Maharishi’s revival of the Vedic principles of Vastu. Maharishi has spoken of the quality of invincibility provided by Vastu communities and homes. 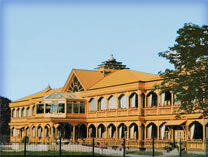 There are numerous examples of Vastu homes surviving undamaged in the face of natural phenomena. 750,000 acres and 4000 homes were destroyed by a series of wildfires in Southern California in November 2003. One of the fires started a few miles to the east of Ramona and roared up the steep hillside overwhelming the community. More than 100 homes in Ramona’s San Diego Country Estates subdivision were destroyed. Remarkably, the six Maharishi Vastu houses were not touched. The following are stories from a couple whose home was one of the six protected by the influence of Maharishi Vedic architecture. 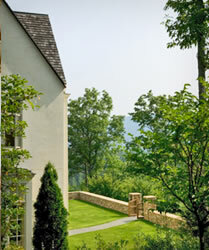 Our Maharishi Vastu home is perched on a high hilltop. The house just to the north of it was destroyed as well as a 7,000 square foot stone house just to the west. 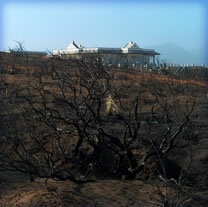 The shrubs outside the Vastu were burned, but not the fence or the house. The fire passed around inexplicably. [One family has] a Maharishi Vastu house under construction, which abuts against the national forest. The forest fire came up to their lot, destroying their house trailer sitting outside the Vastu fence, but it didn’t singe the completely flamable temporary rope Vastu fence as it went around the property. One of the Maharishi Vastu houses was sold to someone [unfamiliar with Maharishi Sthapatya Veda principles]. In ignorance, the new owner built a pool in a location that would create a damaging Vastu effect. The forest fire burned the fence and damaged the pool, and the burning pool fence threatened to set the house on fire. Just in time the fire department arrived to put out the small fire before it could do any more damage. Another series of wildfires raged in Southern California in October 2007. Nearly 750,000 acres were again scorched, and 3600 homes, and 1200 buildings were destroyed. Again, all the Maharishi Sthapatya Veda homes in Ramona, California were protected. The following is one person’s story. It was a major fire. The whole mesa evacuated except families in three Fortune-Creating homes. The group kept meditating all morning, and when they came out, the fire trucks were nowhere to be found. The fire had decided to go around the mesa rather than over it. This was strange because when another [Maharishi Vastu homeowner] and I visited the fire just east of his home, the shrubs and grasses were still burning. It was clear the wind was blowing straight in our faces, but the fire would not move closer to his home or to the mesa, even though there was ample to burn. The fire went out on its own, and residents began returning. Ramona and the mesa were spared. A dot in the middle of great devastation. The area around our home is surrounded by trees about 10-13 feet high. In September 2008 the weather was very hot with a strong, dry eastern wind. In the morning hours a fire started 650 feet east of the village that moved very quickly towards our house and other homes. It was pushed by the east wind, fiercely burning all the trees in its way. The height of the flames was 20-22 feet high. When the fire came near we had to evacuate the house, and we stood at some distance to see what would happen. The fire reached the house. The flames were high, and the smoke enveloped the house entirely. It was impossible to see what happened. After several hours when the fire was out, we returned home and saw something that left us stunned. While four other houses were damaged (our neighbor’s house to the south had $300,000 worth of damage), in our case, the fire did not go over the Vastu fence, but instead it went around it. We would like to stress that our Vastu fence is made of wood. When we examined the ground after the fire subsided we saw that the fire divided in two 20 feet before it reached the eastern fence. One half went to the northeastern corner while the other part went to the southeastern corner. In the northeastern corner, the fire devoured a tree 16 feet high that stood one and a half feet from the fence, without touching the fence, and then it went on to the next tree. A big, plastic storage structure that stood a foot and a half from the fence was burnt entirely, and again the wood fence was not burnt. In the southeastern corner the fire burnt a tree and then proceeded along the side of the fence, not going over it. 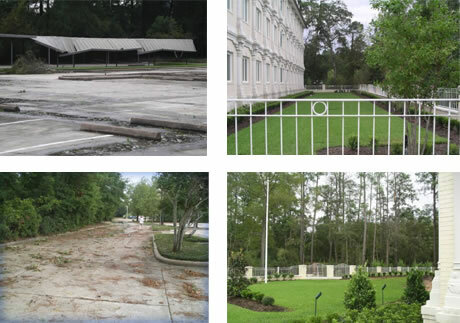 In 2005, immediately after Hurricane Rita struck (the fourth-most intense Atlantic hurricane ever recorded), the area outside the Peace Palace’s Vastu fence was filled with trees and tree limbs that were down everywhere. Inside the Vastu it was pristine, as though someone had taken a leaf blower and cleaned it. Exactly the same thing happened three years later after Hurricane Gustav hit. A visitor who came immediately after that hurricane to inspect the site for damage even asked whether someone had just come over to do yard cleaning because the yard was so immaculate. The TV tower crashed down, electricity poles fell like ninepins and mighty trees were uprooted as the super cyclone vented its fury, but the numerous temples in the city remained untouched. Amid the ruins everywhere, these shrines still stand erect. Not a single structure, a majority of which date back from the sixth century AD to the 12th century AD, suffered damage. At some places even the flag atop the temple was not blown off, though the wind velocity in the state capital had touched 250 kilometers per hour. The same was the case with other temples in the entire coast where the storm had left a trail of death and destruction. According to State Archaeology Department Superintendent, B K Rath, the city had as many as 320 temples dating back from the 6th century AD to the 18th century AD, but none of the shrines had collapsed or suffered substantial damage in the cyclone. He said that all the religious sites where the temples had been built strictly followed the traditional text of temple architecture and were based on Vastu philosophy. Rath said according to reports received by his department no temple on the coast had been damaged in the cyclone. 2000 Tower Oaks Boulevard, also known as Tower II, is a LEED-Platinum office building designed according to the principles of Maharishi Vedic architecture. I feel energized! I am able to concentrate more on my task for the day. The stress of a workday doesn’t get to me like it used to. Everyone has stress from time to time. But I have to say that since we moved into this building, I feel more relaxed and peaceful. I absolutely love the building. Even though there seems to be more happening here at Tower II, my concentration is getting better every day! It feels like I get a breath of fresh air when I enter the building. Then I feel calmness as I move around the office space. Even though everyone seems busy, there is no feeling of stress or panic. Just a great all-over feeling. It’s very comforting being here, like being at home. In fact, when things are stressful at home, this is the first place I think to go to. Typically, when I am in an office, I would much rather be outside. It is not the difficulty of my work that bothers me; it is my aversion to being confined. Here, I don’t feel confined. For the first time in my working career I am not longing to be outdoors. Not only am I happier, but my colleagues are noticeably happier since we have moved to these offices. Almost everyone walks around smiling. 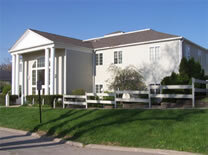 Over a decade ago, we built the first Maharishi Sthapatya Veda office building in Fairfield, Iowa. This building inspired the entire community as well as visitors from around the world. We had a waiting list of potential tenants as the building filled up before we even finished construction. Our company moved in and immediately went through a very positive transformation. Every day our brokers experienced more clarity of thinking, more and harmony, and business relationships grew stronger. Very soon the company reached a point where I no longer needed to manage the day-to-day operation. The brokers became a self-supporting team and very soon became the largest and must successful company in our industry serving the mid-continent of the United States. The prediction from the consultation service was that the building would create wealth, outside companies would be attracted to companies inside the building, the occupants would have distinction of speech, and the building would throw off negative influences. All of the predictions came true!! We have had the most wonderful experiences in our home and office, both designed with Maharishi Vedic architecture. Even though we deal with the tragic day-to-day events of illness at our place of business, patients actually enjoy coming to our office. Once they complete their [cancer] treatment, they miss the experience of coming to our center, which they very much enjoy even during their ongoing treatment. My own experience has been of opening out into much greater lightness, creativity, and positivity. Everything is less of a strain, and I love coming here and being in the new office. Anything seems possible, and I wonder why I saw boundaries before in areas where now I see pure potential. Also, although the business I am in (magazine publishing consulting) is contracting, and times are very difficult for publishers, I have gotten new business inquiries every week since we came here, and have brought on two new accounts. Since most of my clients are with me for years, each new account is very significant. I have a couple others that I’m waiting to bring on. And one of our big clients, who was very difficult over the past year, has once again become very easy and appreciative, a pleasure to work with. Also my husband, who also works in the building, has appeared much more smooth, positive and happy. The first time I walked into the new Vastu office building was still in the building phase, but I didn’t want to leave. I wouldn’t have minded setting up a desk amidst the construction. That experience has continued. I come to work and it feels lively and supportive. Other than the feeling in the office, there’s two things I’ve noticed. The first is that when a problem comes up, it’s both easier to solve than it would have been before and feels like a smaller problem. I first noticed this within the first day or two of working here when, in one afternoon, I accomplished something I had spent days working on. The second is that I’ve also found that communication has improved in our office. Work feels more collaborative than it did before.